As a writer, words are important to me. They are the basic unit of understanding. Not understanding a word can prevent the understanding a sentence, which can prevent the understanding of a thought, which can prevent the understanding of a whole subject. And conversely, the understanding of just one word can make something go so right it can be life-changing and even world-changing. I had a dramatic example of this one day when I decided to look up the definition of the word advocate, after almost forty years of calling myself a consumer advocate. I looked up advocate and then consumer advocate online and when I saw the results and started exploring them I realized that consumer advocate was NOT the right term to describe myself. 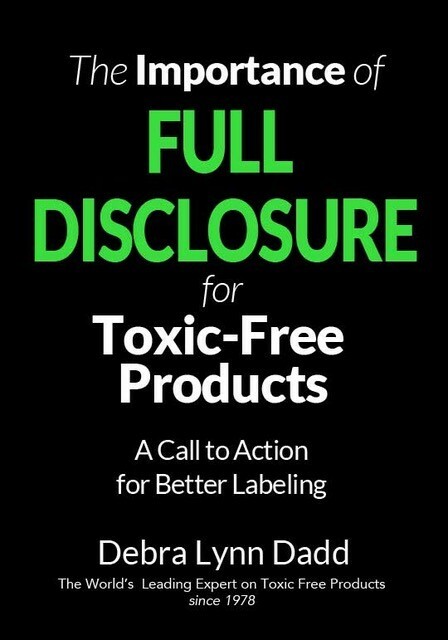 I actually was “The World’s Leading EXPERT on Toxic-Free Products” And once I named myself with the correct definitions of words and figured out what I should be doing to be that, I took this website from an idea I had been thinking about to a reality. So please, do take the time to look up any word you don’t understand, especially if you are struggling to understand any of the ideas on this website. Never underestimate the clarity and power that can be released with the understanding of a word. This entire site is actually a glossary for many words associated with the subject of toxics in consumer products and choosing safe products. This glossary contains some general terms not defined elsewhere. Please take as much time as you need to understand words. Take my definitions as a starting point and continue to explore untill you reach the satisfaction of understanding. The internet is a wonderful tool that goes far beyond a dictionary. Well! The world is catching up with me. After forty years of talking about things toxic…the Oxford English Dictionary chose “toxic” as the Word of the Year! There was a 45% rise in the number of times the word was looked up on the Oxford Dictionary website.